With the summer season halfway through, Thornbury’s third and fourth teams are close to the top of their divisions. The second team has a real prospect of promotion, sitting currently top of their division, having picked up 44 out of a possible 50 points. The experienced pair of Malcolm Worster and Mike Peatheyjohns, along with the Junior/Senior combination of Luke Johnson and Wayne Russell, have dominated their division. With support from other juniors, Leo Lazarides, Charlie Cook and Kyle Broadley, and the power hitting of Dan Spalding and Brendan Wilde, the second team plan to maintain their lead position through to the end of the season. Of the four ladies’ teams, the first and fourth teams are currently mid-table. The second team comprising Rae Bezuidenhout, Carole Boulton, Linda Mantle and Claire Hawkins are in second place and are aiming to top their divisions by the end of the season. The third team is making progress after a slow start and is also in second place. They secured maximum points in their recent match against Rodway Hill II, despite Gill Harrison playing with a dislocated finger. The junior pairing of Brooke Daunton and Susanna Ogden are making a serious contribution to these results. 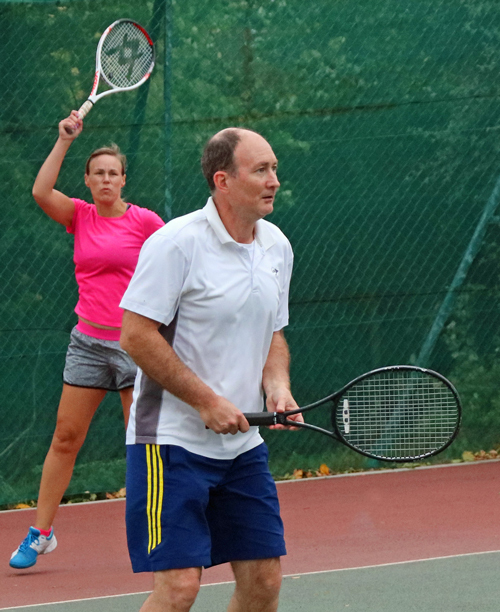 Thornbury Lawn Tennis Club has 10 teams of 4 players in the LTA Avon Summer Leagues: six men’s and four ladies. The club has been represented by a total of 57 players so far. You win some – You lose some! Thornbury Men’s IV’s recently played Portishead Men’s III’s. Mark Wilkinson and Oscar Harrison, who have little experience playing league tennis, took the first set 6-3 but lost the second set 2-6 in a finely balanced contest. As it was drizzling, they agreed to play a championship tie break to decide the rubber, which Portishead won 7-5. On returning to the clubhouse, they were advised they hadn’t completed the rubber as a championship tie break is the first to reach 10 points with a margin of 2. They were sent back on court in the drizzle and Mark & Oscar eventually won the championship tie break 12-10 turning the ‘loss’ into a win. As a result, Portishead IIIs and Thornbury IVs are second and third in their division. Whilst this was underway, the second pair Hugh Boyes and Brian Jordan were leading 6-4 and 4-2 when Brian broke a string. His spare racquet didn’t feel the same and Hugh and Brian only managed to win two further games in the rubber finishing 6-4, 4-6, 2-6. Wouldn’t it be nice to have the same backup as the pros! Photo 1. Brooke Daunton & Suzanna Ogden have won 5 of their 6 matches playing for Thornbury Ladies II’s & III’s. Photo 2. Mark Wilkinson & Oscar Harrison of Thornbury Mens IV’s dominating the net against Portishead IIIs. Photo 3. Luke Johnson playing in Thornbury Mens IIs recent victory against Henleaze IIs.